Wicked Grounds Cafe – 289 8th St, SF, near Civic Center Bart. Wheelchair accessible. Farley’s Cafe – 33 Grand Ave in Oakland, near 19th St Bart. Wheelchair accessible, though outlets for laptops are on the 2nd floor only. We always welcome new individuals into our local leadership circle, and the dates our our monthly leadership meetings vary each month. We also coordinate visits to see our penpals and have t-shirts by donation to help with our costs. Email for more info, or drop by an event. 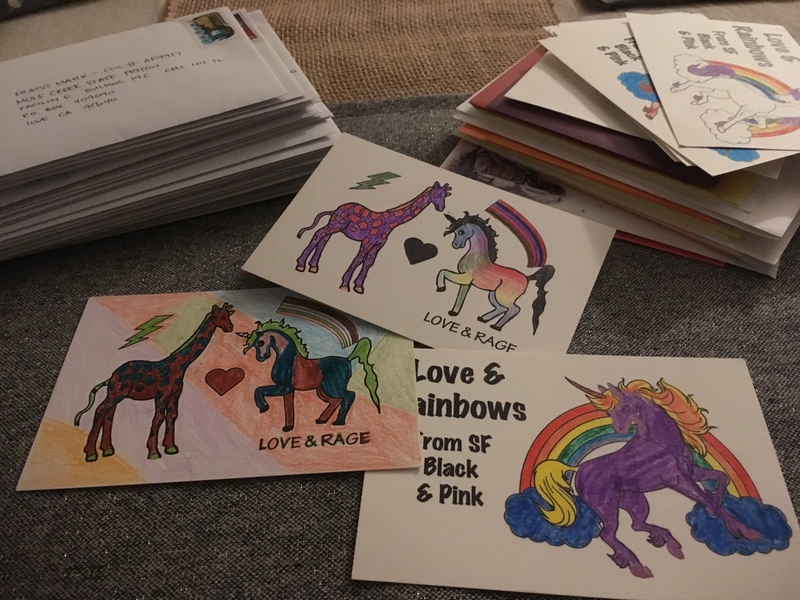 Join us for our monthly night of mail processing/data entry, birthday cards to our LGBTQ members in nearby Norcal prisons AND long-term penpal orientation and matching. Food and beverages are available for purchase from the cafe. And please bring some dollars and change toward postage, if you can. Any money raised beyond the cost of supplies will be used to support both local & national Black & Pink projects. 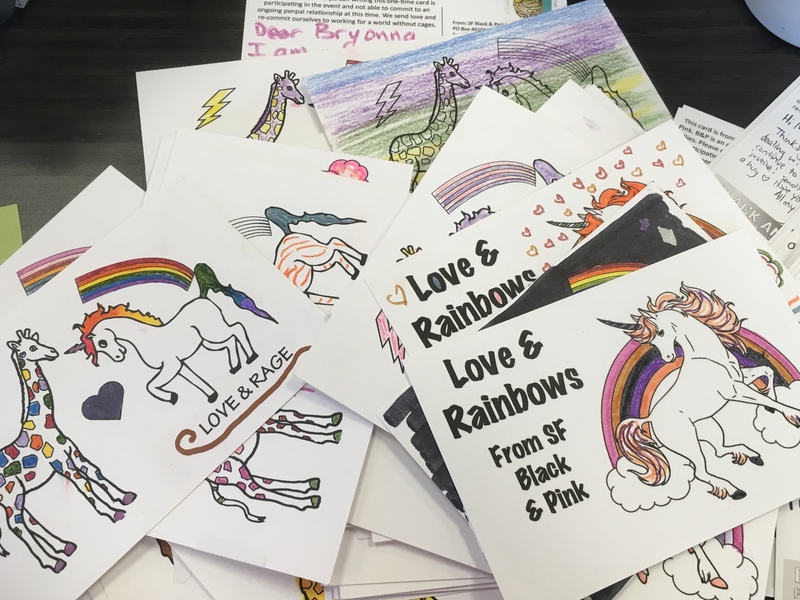 Save the date – we’ll be tabling again this year at SF Trans March and sending postcards to our members! We are actively seeking new folks to get involved to help grow our Leadership Circle in order to help make this work happen more regularly. Email if you want to get involved and we’ll make a time to connect. California Coalition of Women Prisoners (CCWP) is currently working on a campaign to end the use of Life Without Parole sentences as well as asking Governor Brown to commute all of the LWOP sentences to parole-eligible sentences. If you are a part of a social justice group, faith-based organization, or advocacy group, please sign on here to support the campaign and to learn more. We will be visiting Mule Creek State Prison on April 28th and scheduling more prison visits for 2018 to our B&P incarcerated members in Northern California. If you have a penpal and are interested in visiting them, request that they send you a visitation form and then send it in. Then let us know. If you are interested in visits with us but don’t have a penpal, we can match you to someone. We have visited Mule Creek State Prison, San Quentin and plan on returning to those as well as visiting California Medical Facility, CCWF, and possibly CSP-Sac or others. PLEASE share with your members! Although Black and Pink provides many direct services to LGBTQ and/or HIV+ prisoners and court-involved people, the goal of our work is to strengthen the movement towards abolition of the prison industrial complex. The role of the National Organizer for Black and Pink is to support local outside chapters in their grassroots efforts, provide support and resources to prison-based chapters, develop and lead a national strategic organizing plan with clear goals and concrete actions to take. The organizer is also responsible for some direct advocacy work with prisoner members who are in crisis. Black and Pink only hires individuals with a history of incarceration and we strongly encourage applications from individuals most impacted by the prison industrial complex. This is a full time position, 40 hours per a week. This is a salaried position, $40,000 a year, paid on the 15th and the last day of each month. There are four weeks of paid vacation annually, and compensation time is accrued if working over 40 hours a week (though working more than 40 hours a week is strongly discouraged). Black and Pink full time staff have 12 sick days per year. Black and Pink does not provide staff with health insurance at this time, though monthly / annual premiums for healthcare obtained through Mass Health will be paid for through Black and Pink (state funded healthcare in Massachusetts). Black and Pink will also provide a $60 a month membership for either Massage Envy, $60 a month for a gym membership, or $60 a month for another form of other self-care practice. The ideal candidate for this position will have some experience with organizing and a willingness to get training on effective organizing tactics. The ideal candidate will have strong, compassionate, communication skills. Given the intensity of the work required by staff at Black and Pink, the candidate must have the ability to be compassionate and empathetic with prisoner membership and others directly affected by the criminal legal system. The candidate must be able to demonstrate effective time management, attention to detail, and prioritization of tasks as the position requires managing many different and even conflicting needs. A background with computer skills is a must, as the candidate will also have to learn Black and Pink’s data storage systems, utilize Gmail and Microsoft Office, and know how to navigate social media appropriately. The candidate must also be willing to travel regularly, primarily by plane. Black and Pink’s national office is located in Boston, Massachusetts. The ideal candidate would either live in the Boston area or be willing to relocate (with financial assistance from Black and Pink to do so). There are possible exceptions. For individuals with extensive organizing experience and a history of working remotely for another organization, considerations for remote employment could be made. That person would, however, be required to come to Boston for 3 weeks of training and relationship building at the start of the employment. Provide guidance for grassroots efforts being done by local chapters. Supporting and planning national gathering of B&P members (every 2 years). This position is supervised by the National Director. Supervision should occur for one hour every week. During supervision the National Organizer should communicate about upcoming goals, needs for training or support, obstacles in the work, and emotional support needs due to the severity of the work. 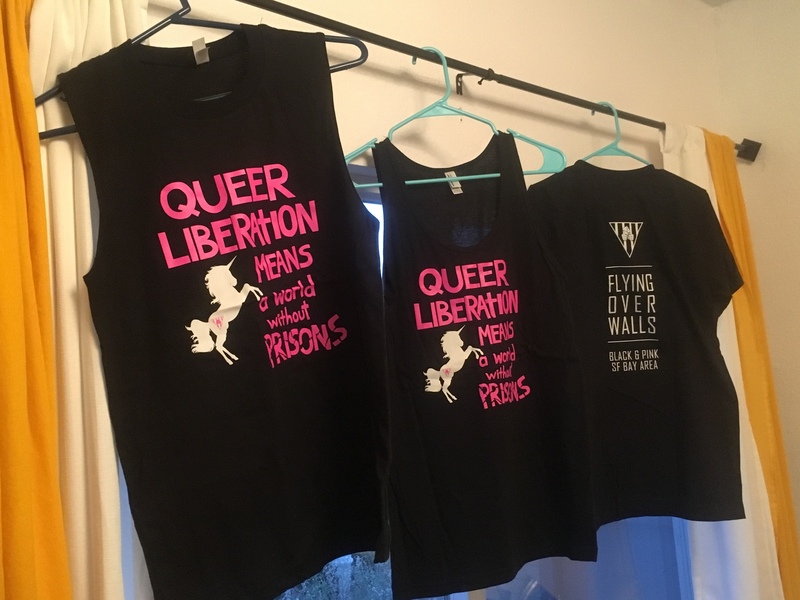 Flying Over Walls, the Bay Area chapter of Black and Pink, is planning the third round of our “Queer/Trans Prison Abolition Study Group” for this coming Fall 2015. This session will be quite different from the past two because instead of having only free world folks involved, we are in the process of recruiting 10-12 incarcerated folks who are interested in discussing the readings through penpal letters. -Support the building of leadership development skills and shared understandings between both incarcerated and free world leaders. 10-12 incarcerated folks will be paired with 10-12 free world folks. We send out 1-2 readings on prison abolition at a time to our incarcerated members and ask for a letter back with comments, questions, etc. The readings will be varied in style- some will be formal articles or excerpts of book chapters, others will be parts of graphic novels or mixed media/art. Our intention is to maximize reading accessibility for differing levels of education. Free world members do the reading between meetings and bring thoughts, questions and reflections to the meeting. Each incarcerated person’s letter gets read aloud during the meeting by their free world partner. Outside folks discuss both the readings and the perspectives from the prisoners’ letters. At the end of each meeting, free world participants will write a short letter to their matched person. We audio record this discussion. After the meeting, the recording will be transcribed, any content that might get labeled as a Security Threat will be edited to increase safety of our incarcerated members. We send the next packet back to the folks inside which includes: everyone else’s letters from the inside, the transcribed discussion, next month’s reading, and a personalized note from the partner with whom they are matched. Incarcerated participants are currently being held at CA Medical Facility, Mule Creek State Prison, CSP-Sacramento, San Quentin, and Central CA Women’s Facility. We ask that folks make a solid 100% commitment to attendance in order to join. It is crucial that we stay accountable to our folks on the inside. Obviously, emergencies may arise, but please confirm you can attend these dates before registering. Please check out this link for all the details and to register.